Purple Parenting > Blogs > Uncategorised > Fussy eating – definitely not a piece of cake! Comments Off on Fussy eating – definitely not a piece of cake! So, just to make it clear, the type of fussy eating we are talking about here is the picky pre-schooler, the faddy feeder and the testing toddler. The child who woke up one morning and decided they no longer like egg.. or sandwiches.. or fruit.. or chicken or…the list is endless! It’s about the child who used to eat everything and then stopped, whose new mantra is “Urgggh..I don’t like it”. For some children there are underlying reasons around their reluctance to eat, linked to additional needs or medical issues. Some children have very strong, sensory reactions to food – its taste, texture, colour and smell, which results in a highly selective diet, deep anxiety and concern, which may need specialist support. This blog is about more general fussy eating, linked to developmental stages and young children’s behaviour. Between 18 and 24 months children instinctively become more suspicious of new foods. As they grow and develop, they also naturally become more independent and quickly learn that they can control what they eat, when they eat and how they eat. This stage of development, mixed with their newly-found independence can result in mealtimes becoming a real battle ground surrounded by frustration and anxiety. 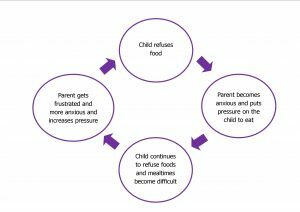 Naturally, as parents the first thing we do when a child refuses food, is to persuade, cajole and coerce them to at least try a little. However, as it continues, fussy eating can develop into a very negative cycle. Understanding the reasons behind fussy eating and that it is a normal developmental stage can lessen its impact. The first step can be just learning to back off a little. Imagine what it might feel like to have food put in your mouth that you do not want or actively dislike. Imagine going out for a meal with friends, with one of them repeating to you over and over again, “Come on, hurry up, eat you dinner, come on try some of your vegetables”. Nothing would be more guaranteed to put you off your meal. Think about mealtimes in your own house – if you were in your child’s shoes – would you start to refuse to eat your dinner? Although lifting the pressure off your child and no longer making food an issue is a really tough thing to do – it can be the start of a new, far more positive relationship with food for you and your child. Try to eat with your child as much as possible. I know modern life can make this very difficult, but sharing a family meal together with your child can improve eating. You are the best role model for your child. If they see you eating the same food as them, this in turn can become a trusted food and encourages them to try more. Offer meals that a child already likes. I know it sounds obvious, but if they are overwhelmed with new foods, they will naturally refuse and mealtimes will become more of a struggle. A healthy, repetitive diet is ok.
Add new foods gradually and on a separate plate. If a child is wary of a new food and shock, horror, it should touch a food they like, it can often mean that the favourite food is also rejected. Encourage your child to try a tiny (grain of rice sized) amount of a new food, but don’t force or make it a massive issue. Chances are your child will reject it…many times, it can take up to 14-16 tries of a new food for a child to get used to it and possibly like it. What is important is that you are slowly exposing your child to what new foods look like, feel like and smell like. This stage has to happen before a child trusts a food enough to actually put it in their mouth. Although praise is important when a new food is attempted, try not to go too overboard with this. If a child receives a standing ovation every time they sniff an aubergine, it continues to keep food high on the agenda, instead of reducing the focus on it and therefore the pressure. Allow about half an hour for a mealtime. Young children get bored quickly, so if they are sitting there at a meal for longer than this, they will naturally dread mealtimes in the future. Offer 3 meals and 2, small, healthy snacks evenly spaced throughout the day. Children need to sit down to a meal hungry. Snacks and drinks too close to meal-times means children will naturally refuse the food. Keep portions small, children need much less than we actually think they do. Dinner plates are much bigger than they used to be, which gives us the false impression that we have to fill it. Using a much smaller plate and giving smaller portions is less daunting and encourages a child to eat. If they finish it – you can always offer a little more. Trust your child, if they say they are full they probably are. Be careful of supplementing a refused meal for a favoured meal. Children quickly learn that they do not have to eat the first food offered and will get their preferred foods instead. Offering preferred foods, with a tiny piece of new food on the side is a far better approach. Finally, some children learn they can get a lot of attention by refusing to eat. Family life can become focused on what a child eats and what they don’t. Patterns of behaviour develop around children receiving attention for creating battles around food. Stepping away from arguments, ignoring outbursts and reducing attention for fussy eating, making sure you praise and encourage when things go well, can start to re-balance behaviour. When eating issues are attention seeking try not to discuss it in front of your child, family and friends, as this can reinforce the behaviour and prompt it to be repeated. Sarah and Michelle run a company called Purple Parenting, offering behaviour and sleep support through individual work, groupwork and workshops. Email info@purpleparenting.co.uk to arrange your free telephone consultation to help with selective feeding and fussy eating, sleep, tantrums, aggression anger, anxiety and more.